Private tours with own historical car and English or German speaking guide Special service only available for guest from Mayada Living. During the journey, you have an excellent opportunity to discuss the socio-cultural themes of Cuba , such as the ethnic make up of Cuba, family structures, economy, education, health, cultural development, etc. 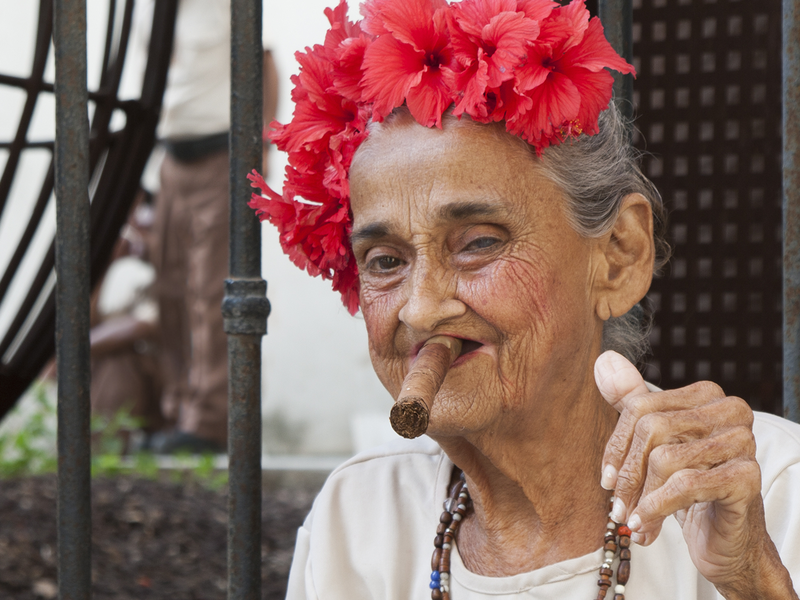 After this tour, it is much easier to understand and live the fascinating and vibrant Cuban life. Our guide will also give you insider tips and information about transportation, non tourist and interesting places you can visit, restaurant and nightlife locations and arts galleries to help you to explore the city by yourself. The tours are avalible to our guests only! Explore the capital city of Cuba. The perfect place to dig into the history and development of the largest Caribbean island. On this tour you will visit the most famous sights of the capital. “Callejón de Hamel”, a little street with mural paintings and Cuban Rumba (on Sundays), where you can experience the deep roots of Cuban religions. Tour Valle de Vinales: The World Cultural Heritage "Valle de Viñales" is one of the most fascinating landscapes of Cuba. The microclimate of the valley is ideal for growing tobacco and therefore here are arising the world's best Habanos. The rugged conical cliffs of limestone (mogotes) dominate Viñales feature: a spectacular view to the visitor. They are reminiscent of different regions of Asia. Visitors have the opportunity to go for a walk of about one hour through the valley, and visit a tobacco farmer and his family. There you can learn a lot about the secrets of the tobacco production, from seed to finished cigar, and the variety of other Cuban products, such as Coffee and Yuka. Other attractions are the caves (Cueva del Indio) of Viñales, the city Viñales and the Prehistoric wall. It’s also possible to explore Viñales on horseback or to visit other parts of the valley and to have lunch in a ¨Paladar¨ (a little restaurant, which offers typical creole Cuban food). If you want to overnight in the city Viñales you have the possibility of visiting the ¨Fábrica de Habanos”, one of the famous cigar factories of Pinar del Rio in the return to Havana. This will not be only a tour to the most important places in the area, our guide and our driver know the area very well and will bring you to non-tourist places in Pinar del Rio. If you want to enjoy the hot spot relax and comfortable we recommend to take the classic tour with 2 days and one overnight in Viñales valley. Las Terrazas is a rural touristic community, which is situated on a waterside of San Juan river in Sierra del Rosario. This little community is gain of the UNESCO´s project for reserving the biosphere of this place. The earnings of the national and international tourism are invested in the careful of the environment. Once you are there you can visit Polo Montañez´ museum. Polo was a Cuban singer and songwriter, who learned by himself to play some instruments, to sing and to indite. In this museum you will know about his life and his great music. To jump and to make a trip around the beautiful landscape in a cable is possible too (Canopy). Following these activities, you can make a visit to San Juan river and to take a relaxing bath there. Soroa is located between La Habana and Viñales. It is well known for its wonderful waterfall, the “Salto de Soroa”, when you can even take a bath and its orchid garden, which counts with more than 20 000 specimens of 700 species. Our tour guide will also bring you to a great viewer, which is located in ¨The Castle of the clouds¨, when you can get some cocktails at the same time you are observing a wonderful landscape. 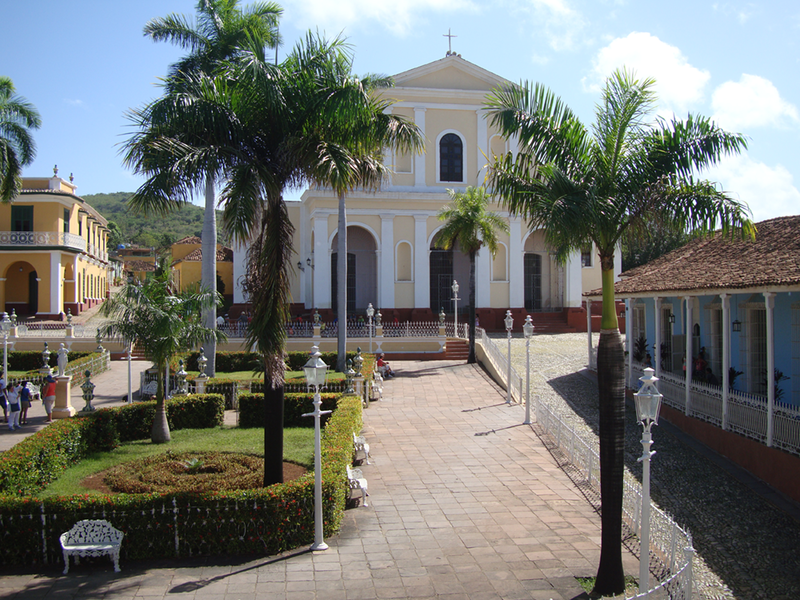 Trinidad is the fourth of altogether 7 cities in Cuba, which were founded by the Spain in 1514. No other city in the country is as well-preserved as Trinidad, whose colonial buildings are reminiscent of the great halls of a museum. Trinidad is a national monument, which is located in a valley. It entire environment were honoured a "World Cultural Heritage” by the UNESCO in 1989. Day 1: The tour to Trinidad begins with a stop in “Cueva Los Peces” in Zapata Swamp, in the province of Mantanzas, the deepest cenote in the country is located here, also a large variety of water activities are offered in this area. 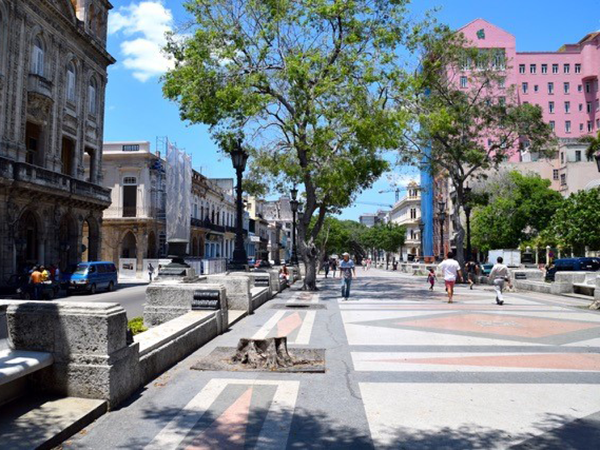 Following a city tour in the center of Cienfuegos is possible to visit another Cuban city honoured as “World Cultural Heritage” by the UNESCO.In this city you can enjoy a walk into a living museum city with a big French influence architecture. The arrival in Trinidad will be in the late afternoon, so sightseeing can also be performed at this day, depending on your desire. Day 2: The following day you can choose between on of the tours in the natural parks near Trinidad. “Parque Nacional Topes de Collantes ‘or’ Parque el Cubano”. These are walking tours of 1-3 hours a day. On the way to the national park you will enjoy pure nature between many endemic plants. 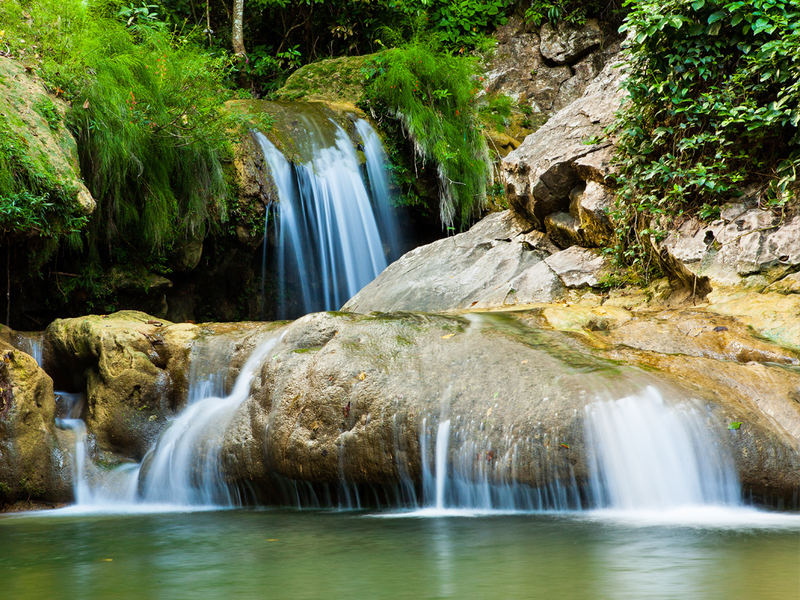 Arriving the waterfall, you can take a refreshing swam in the cool & clear freshwater of the lake. Another possibility would be to take a rest at the beach “Playa Ancón”, located in the peninsula 10 km away from Trinidad. In the evening we will return to Havana.